Launched February 09, 2010, Google set out a challenge to Facebook and MySpace in the form of Google Buzz. A conference held at Google’s Mountain View headquarters on February 09, 2010 took the tech world by storm. Google took a leap into the Social Network biz by introducing its own social network; Google Buzz. What Google Buzz is all about? Google Buzz is a new social networking website that upgrades Google’s Gmail and expands on the features already coined by MySpace and Facebook. Google Buzz is the first email host gone social network and has cool new features like full Picasa, Flickr, Google Reader, and Twitter integration, email support, no foreseeable character limit, and GPS tracking via mobile phone. Google Buzz is built around Gmail and is thought to be a Facebook and MySpace competitor. Google decided to take on big competitors like MySpace and Facebook and has released Google Buzz, its very own social network. Current Gmail users might have noticed the Google Buzz button under their inbox and are able to join Google Buzz without setting up an account (just by using Gmail). Google Buzz is best described as an RSS feed merged with a social network website (like MySpace or Facebook). If you already have a Gmail account, you’re already signed up and to newcomers; Google Buzz only requires creating a Gmail account to enjoy. Google Buzz is built on Gmail and could be looked at as a major Gmail upgrade, but it might downplay its value. Gmail, using Google Buzz, allows users to share photos, videos, updates, and more with their current Gmail network and also recommends new friends. Like Twitter, Facebook, MySpace, and other social networks; Google buzz allows posting status updates, but offers the option of making the status public or only viewable to a private network. The new Google Buzz social site uses Gmail as much as possible. Updates on Google Buzz are sent straight to your Gmail inbox, you are able to send messages to other friends via Gmail, and your Gmail account is turned into a super RSS feed. 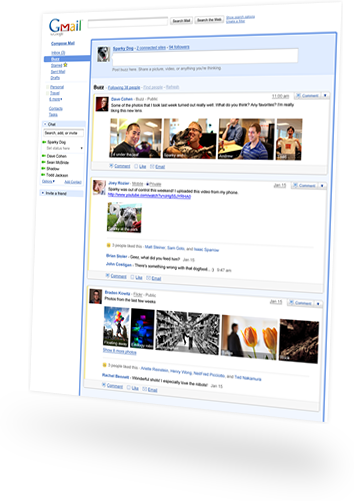 Google Buzz also gives social networking enthusiasts the convenience of using other social networks by integrating Picasa, Flickr, Google Reader, and Twitter. This popular email host (gone social network) is sure to hit the social networking community by storm. Gmail, integrated social networks, public and private chat, photo and video sharing and other features makes the launch of Google Buzz very tech worthy. Google Buzz even allows Gmail users to use Google Buzz on their mobile phones for connecting with their friends on the go. This social network is showing lots of promise at its start and is sure to expand and become greater.